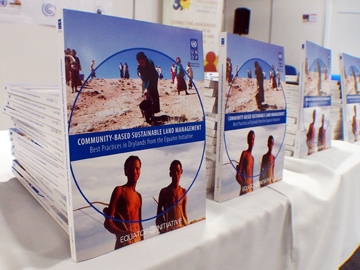 On 18 September 2013 during the UNCCD COP-11 In Windhoek, Namibia the Equator Initiative published a case study compendium highlighting lessons learned in sustainable drylands management from Equator Prize winners. Since 2002, the Equator Initiative partnership has been working to recognize and advance local and indigenous efforts that reduce poverty through the conservation and sustainable use of biodiversity. One of the primary ways this is accomplished is through the Equator Prize, awarded every two years to leading examples of local sustainable development solutions for people, nature and resilient communities. To date, the prestigious international prize has been awarded to 152 local and indigenous communities, many of which are active in sustainable land management in drylands ecosystems. This case study compendium brings together detailed case studies on twenty Equator Prize winners that have demonstrated outstanding achievement and success in sustainable land management. Each is from the African continent and each tells the story of community leadership in addressing those social, environmental and economic issues that are specific to drylands ecosystems. The intention of the compendium is to present and promote these community projects as best practices in sustainable land management, and to offer them as instructive examples of the environment and development dividends that are possible from empowering local and indigenous community management of dryland ecosystems and resources. The case material, lessons and guidance put forward in this compendium are offered as an input to the Eleventh Conference of the Parties to the UN Convention to Combat Desertification (UNCCD). This book is best understood and appreciated, then, with reference to the complete case studies, which are catalogued in the Equator Initiative Case Study Database. For an abridged summary of key insights from UNDP's work at the local level, download a 'Policy Brief on Local Action'.